Skills are the expertise or talent that is necessary for the applicant to work on a certain position. They answer the question: "What can I do and what have I done before?". They’re good at presenting and "selling" the candidate. 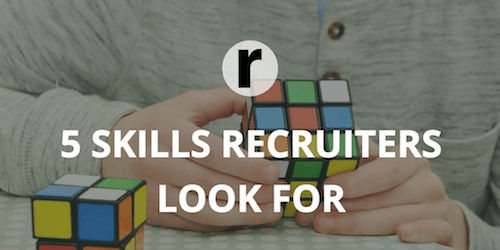 Do recruiters pay attention to skills in the resume? Everything depends on what purpose the employer has set for the recruiter. It's clear that the paragraph describing the skills isn’t crucial. But it can affect the decision to invite a specialist for an interview or not. The trouble is that sometimes people confuse skills with personal qualities and write in a resume: "I find a common language with people, I know how to work in a team." This is a stereotyped and thoughtless approach, which shows that the applicant didn’t even adapt his "professional business card" for a specific job. Nevertheless, there are some skills that, if properly justified, will be a big plus in any resume. There is an opinion that they are needed only for managers. This is not true. Even if you don't lead people, this doesn't mean that you don't need a managerial skill. This person knows where to go, makes a team and leads it to the goal. He is confident in himself, resolute, knows how to take responsibility, to convince others of his own right and to admit mistakes. Conversational skills will be useful in many life and work situations. It's much easier for a person to adapt to a new workplace and join a team if he can speak beautifully. And during the work, the conversational skills will help to calm the raging client, motivate colleagues to achieve their goals, conduct a presentation and negotiations with partners. If it's about you, describe this skill, backed up with a real example from your practice. You don't need to know the answers to all the questions and solve all the problems that may arise in the course of working life. But this is not a reason to run to the head of the company in the hope that he'll solve another difficulty. If you have a well-developed research skill, then you understand where to look for an answer, who to talk to, what specialist to contact, and you are able to build an algorithm for solving the problem on the basis of the information obtained. For this, you'll be appreciated in the workplace. Most people are afraid of change. It's understandable: the changes can be difficult. But for the growth of the company, the development of employees, increasing profits they are simply necessary. If you know how to be flexible, adapt to the situation and work effectively in an era of change, then don't hesitate to write about it in your resume. Under other equal conditions, employers often prefer those candidates who know foreign languages. Such specialists get a chance to take a decent, highly paid position in companies operating at the international level. Knowledge of a foreign language helps in finding a job. It says that the job seeker is purposeful and assiduous. Such people are the best workers. Let prospective employers find out about your dignity at the stage of review of the resume. Learn to distinguish skills from personal qualities. For example, communicability is a quality, and a great sales experience is a skill. Prepare a resume for a specific job, list specific skills that will be useful to this particular employer. Read the vacancy. Don't write more than 3 skills. Justify each skill. For example: I am multitasking (I led 10 projects for a month). If there is nothing to write, it's better not to write anything at all. And yet, skills are a delicate thing. Therefore, Resumance recommends not taking the risk and order a resume from professional writers who know what and how.